I just googled ‘why do Norwegians eat so much beetroot?’. The thing is, I love beetroot. It featured heavily in my childhood years: sliced and pickled, quartered and roasted, carpaccio sprinkled with salt and dill. We had it a top of rye bread open sandwiches, as a simple salad, as a fermented pickle on the side of a plate and of course as a roasted root vegetable medley. To me, beetroot is the promise of health. It has that deep, earthy taste and in a plant based diet it delivers a big dose of iron. 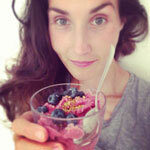 In this smoothie I used powdered beetroot. It is just as healthy but is takes away the time needed to peel and cook the beetroot making it a viable quick and easy breakfast option. Place the beetroot, frozen berries, milk, date, kale and banana into a blender and blend until smooth. 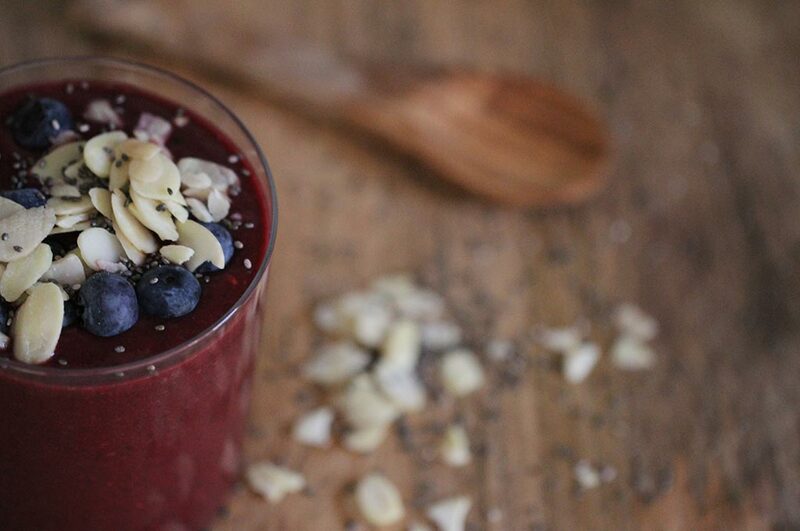 Pour into a glass and top with berries, almonds and chia.